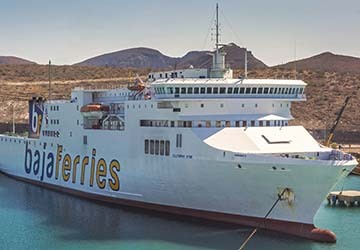 Built in 2001 and part of the Baja Ferries fleet since 2003, California Star provides a comfortable and entertaining way of travelling between the Mexican mainland and Baja California Sur. On board there’s room for 900 passengers and 100 cars, with 49 crew members catering to all your needs whilst you make your trip. Whilst you sail, you’ll be treated to cosy cabins, a range of culinary options and bars, a boutique shopping outlet, a cinema and there’s even space for you to bring your pet along for the ride. The ship can reach speeds of up to 20 knots on each crossing, ensuring a smooth sailing. The cabin options provide a cosy space for you to lie back and relax on your journey. There is also a variety of comfortable seating scattered throughout the public deck areas. For those with restricted mobility or in need of special assistance, specially designed cabins are available, allowing all passengers to fully enjoy their trip. The self service restaurant provides a buffet style spread with an exquisite range of tastes and flavours, with both local and international dishes. The cafeteria area is the perfect place to grab a lighter snack, with a range of sandwiches, pastries and both hot and cold beverages to savour. The disco bar area delivers the perfect way to pass the time on your Gulf of California crossing. With a great selection of everyone’s favourite tipples and music choices, your journey will fly by. In the mood for a bit of retail therapy? The on board boutique allows you to buy gifts, souvenirs, travel necessities or maybe a little treat for yourself, all at competitive prices. The whole family can have fun together with the screening of some of the latest blockbuster films. The screens are in a spacious and comfortable seated lounge area for all to enjoy. Bringing your four legged friend? On the outdoor area of the top deck there is space for up to 12 transporting enclosures for your pet to travel safely. Please Note: Whilst we have taken great care in making our California Star guide as accurate as possible, onboard facilities, services and entertainment may vary depending on the date and time of year that you travel, facilities mentioned may change without notification and ferry companies reserve the right to operate vessels other than those mentioned at time of booking without prior notification.